Sat 1st July. Tickets £10. Over 65 and students £9. Age 6-15 £5. 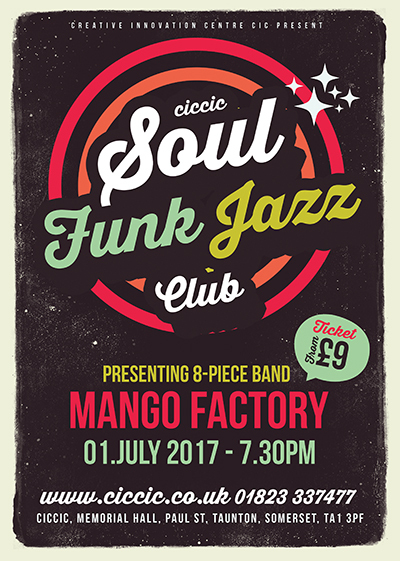 CICCIC’s Soul, Funk, Jazz Club continues its great live music on Sat 1st July with 8-piece soul funk jazz band Mango Factory and with many more amazing bands to come. Mango Factory are a formidable 8-piece live music act playing a unique blend of original music and a few funk, latin, and soul / jazz covers: some well-known and some not so well-known, but all in a unique Mango style. Their music showcases each of the band members musicality, but more important is the overall sound – a great big melting pot of funky jazzy latiny madness. Sound intriguing? Well, come and check it out then. You won’t be disappointed with their locked tight rhythms, dynamic arrangements and multi-instrumental fireworks: plus vocal illuminations from two of Bristol’s finest vocalists Ben Sayer and Aimee Mukherjee!! !